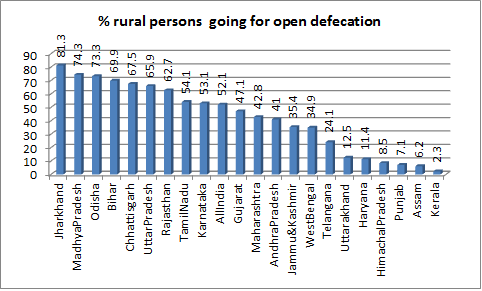 Latest Government of India data suggest that, despite the Swachh Bharat Mission (SBM) cleanliness dive launched by Prime Minister Narendra Modi in October 2014, 47.1 per cent of Gujarat’s rural population still defecates in the open, which is worse than as many as nine other major Indian states. 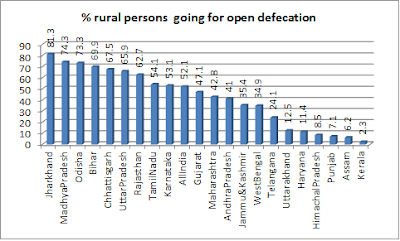 Released in “Swachhta Status Report 2016”, prepared by the National Sample Survey Organization (NSSO), India’s premier data collection centre, the data show that the best performer remains Kerala, where just about 2.3 per cent of people defecating in the open. 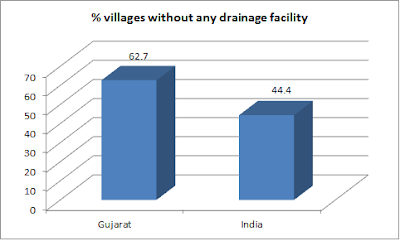 The 2011 Census of India figures, released about three years ago, show that Gujarat, considered a model for other states to follow, had 65.76 per cent of 6,765,403 rural households, which would roughly be 2.28 crore of the rural population, used open fields to defecate. “The construction of household toilets will be undertaken by the household itself and on completion and use of the toilet, the cash incentive will be given to the household in recognition of its achievement”, the NSSO points out. 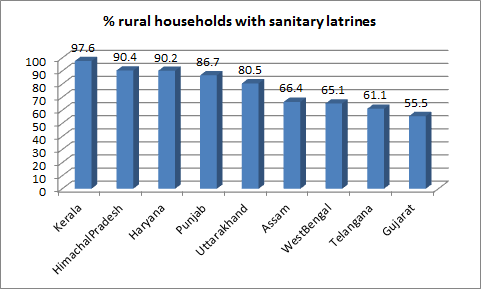 This is against just about 2.4 per cent of Kerala’s rural households not having sanitary toilets, Himachal Pradesh’s 9.6 per cent, Haryana’s 9.8 per cent, Punjab’s 13.3 per cent, Uttarakhand’s 19.5 per cent, Assam’s 33.3 per cent, West Bengal’s 34.9 per cent, and Telangana’s 38.9 per cent. Interestingly, 62.7 per cent of the villages of Gujarat, if the report is any indication, do not have drainage arrangement, which is worse than the national average of 44.4 per cent – suggesting that even if 55.5 per cent rural households may be having sanitary latrines, many of them are deprived of any facilities in the form of what NSSO calls katchi nali or pakki nali.